Competing With Your Own Tenants to Lease Office Space, Why Subtenants Crave Non-Disturbance Protections, Finessing Attornment With Multiple Leases, and the Lease Clause Critique: Two Pro-Landlord Clauses Regulating the Tenant's Subleasing Activities. Punch number one: downtown office vacancy rates rose to 19.9% across the nation in the first quarter of 1993--a six year high--up from 19.6% in the fourth quarter of 1992. Punch number two (and maybe the harder one to see coming): that 19.9% figure doesn't even include space available for sublease that is vacant, but not yet on the market. Vacancy rates for first quarter 1993 for suburban office buildings held at 20.4%, the same rate recorded for the previous quarter. Corporate America's downsizing and consolidation is a major factor in these weak occupancy rates for office building space. Merger activity, particularly in the financial services sector, has left large blocks of sublease space on the market, especially in downtown locations. This means that many office landlords find themselves trying to lease vacant space in their buildings in direct competition with vacant space offered for sublease by tenants in the same buildings. Even worse, the tenants offering such sublease space are often willing to take a lower rent than the landlord would accept for comparable space in the same building. In many cases, the tenant has already made a corporate decision to unload the affected office space at a financial loss as part of the corporate merger or downsizing which made the space superfluous. The cost of real estate disposal (i.e., subleasing the space at a loss) has already been approved by management. All that remains for the tenant is getting the sublease deal done. What can the office landlord do to protect itself from the effects of such sublease competition? That depends upon the quality of the assignment and sublease provisions in the landlord's leases, and upon the ingenuity and aggressiveness of the landlord's management and counsel. Certainly, clauses imposing limitations upon the tenant's marketing and sublease activities represent one area with potential. The negotiation of conditions for non-disturbance of subtenants imposed by the landlord and the landlord's lender in recognition agreements and consents to subleases is another. 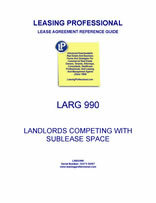 See the Lease Clause Critique for suggestions in both areas.